Al enige maanden ging ik af en toe eens kijken op de website van de University of Chicago Press waar het boek voor mei 2012 werd aangekondigd, of de cover er al was. Pas als die gereed stond, wilde ik het verschijnen ervan in een blog signaleren. Dat is nu het geval. Overigens staat er nu dat het boek in juni zal verschijnen. Uit de aankondigingstekst valt op te maken dat een heel andere dan gebruikelijke kijk op Spinoza en Maimonides wordt geboden. 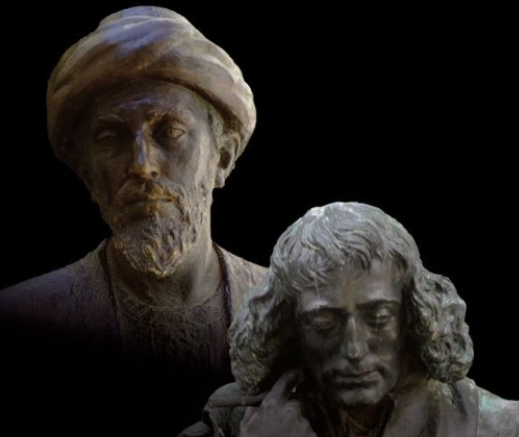 "Until the last century, it was generally agreed that Maimonides was a great defender of Judaism, and Spinoza—as an Enlightenment advocate for secularization—among its key opponents. However, a new scholarly consensus has recently emerged that the teachings of the two philosophers were in fact much closer than was previously thought. In his perceptive new book, Joshua Parens sets out to challenge the now predominant view of Maimonides as a protomodern forerunner to Spinoza—and to show that a chief reason to read Maimonides is in fact to gain distance from our progressively secularized worldview. Turning the focus from Spinoza’s oft-analyzed Theologico-Political Treatise, this book has at its heart a nuanced analysis of his theory of human nature in the Ethics. Viewing this work in contrast to Maimonides’s Guide of the Perplexed, it makes clear that Spinoza can no longer be thought of as the founder of modern Jewish identity, nor should Maimonides be thought of as having paved the way for a modern secular worldview. 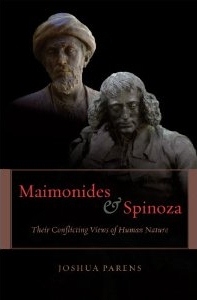 Maimonides and Spinoza dramatically revises our understanding of both philosophers."